Anytime Fitness is named so because it is open anytime. Patrons are all given an access key and can workout at their convenience. Even though it is small, it is packed with a large variety of exercise equipment. Crossfit Workouts are some of the hardest you'll ever experience. That's because their workouts condition your whole body. Many of the county's premier athletes train at a Crossfit facility to reach their highest performance level. Curves of Orem offers a circuit training system for women only, with a class or two for men. The workout is especially popular for those who have not been to a gym for a while - if ever. Elevate Fitness brings all the physical health services under one roof —credentialed physical therapy, personal training, triathlon training, chiropractic, therapeutic massage, and weight loss programs. EXL Fitness offers very personal training and small fitness training classes. It is known for its "boot camp" to quickly shed weight and shape up. Nutrition emphasized. Gold's Gym is world-famous and includes everything expected at a large facility including a pool, spa, free weights, circuit equipment, and lots and lots of bikes. There are two locations in Orem. Planet Fitness in Orem is famous for it "No Judgement" policy. Patron can relax, get in shape, and have fun without being subjected to the hard-core, look-at-me attitude of other gyms. The Pit Elevated in one of the Nation's premier training centers for Ultimate Fighters. There is plenty of work-out equipment for everyone to get in shape. They are home to the Prana Room, a Yoga and Pilates Studio. 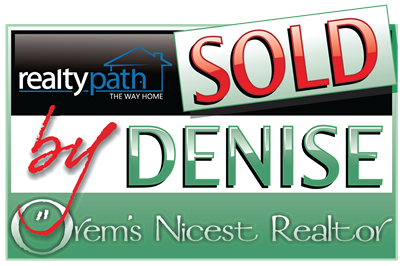 This website is brought to you courtesy of Denise Martin, known as Orem's Nicest Realtor, together with her brother Stacy Sommers who own a Utah Real Estate Company, @Home Realty Network, and make up the SoldByDenise.com team. It would be their pleasure to help you buy or sell a home in Provo or Orem and surrounding areas.